As Director of Land and Facilities at the Schuylkill Center, the care of our trees rests on my shoulders. With 340 mostly forested acres, our tree population is large and diverse in both species and maturity. The recent nor’easters brought heavy, wet snow and a barrage of winds, impacting our trees and in some cases causing damage. 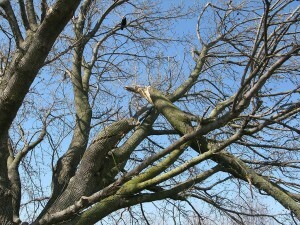 The damage is as varied as the trees themselves. Some trees barely lost a twig, others had major limbs break, and some even blew completely over, known as windthrow. As a tree lover, I know the value of the services these trees provide—sequestering carbon, providing habitat for wildlife, and managing our property’s stormwater—is well worth the effort required to maintain them. 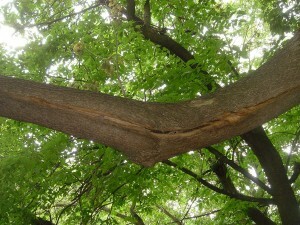 Having well over a decade of experience in arboriculture, I urge you to assess your trees following the recent storms. 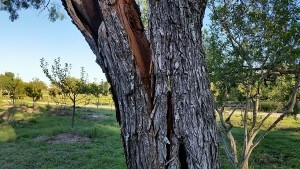 If you have an especially aged tree, the tree has appeared stressed in the past, there have been previous failures in the tree, or there is a high chance of major damage to a valuable target within 1–1.5 times the height of the tree, the best course of action is to call an International Society of Arboriculture (ISA) Certified Arborist (see below). With leaves not yet appearing on deciduous trees (trees which lose their leaves in the winter), now is the perfect time to get out and walk around each tree for a check-up. First, check to make sure you are not walking into a hazardous condition under the tree’s canopy. Look for any hanging branches which may be hanging vertically or resting on other branches, as well as deadwood in the canopy at this time. Deadwood can be identified by loose or missing bark on branches, or the lack of buds on the twigs. 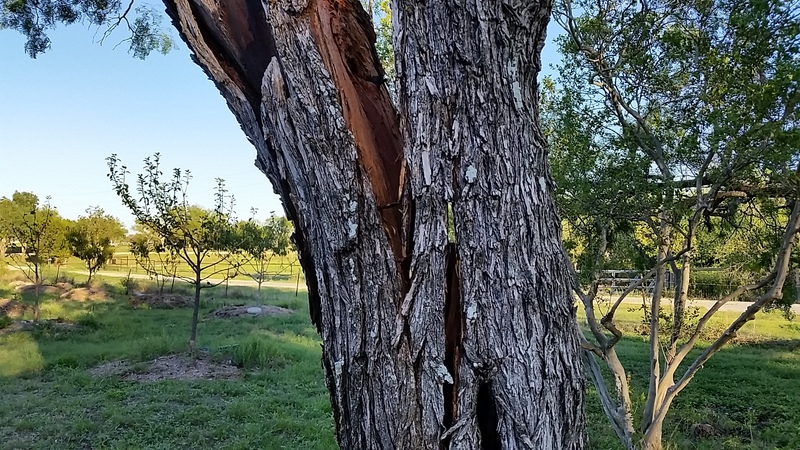 Look for any cracks on the limbs or trunks of the trees, usually noticeable due to the fresh lighter colored wood appearing inside the crack. After the rest of the snow melts off the structure of your tree, you may notice continued moisture around these cracks as water runs out of them. Tree unions are where a stem or branch meets another and it is especially important to check the union of any multi-stemmed tree for signs of splitting. The narrow V-shaped unions are much more prone to splitting than the wider U-shaped unions. by a slight raising of the soil on one side of the tree. 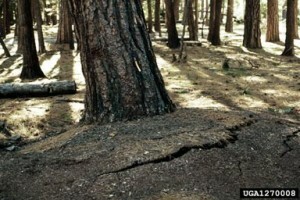 This indicates that the tree is starting to uproot and could fall, often with catastrophic results. If you notice any sign of heaving, newly exposed roots, cracks in the soil on the root plate (pictured), or hear a hollow sound when you stomp your feet around the root plate area, call an arborist immediately. 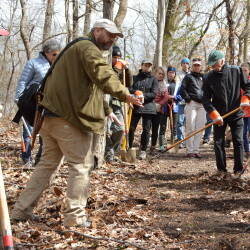 Steve Goin is the Director of Land and Facilities at the Schuylkill Center, and an ISA Certified Arborist. He has worked the land at the Schuylkill Center for over three years and his favorite large tree is the Swamp White Oak. He lives across the river in Wynnewood with his wife and daughter, who can’t wait to attend Nature Preschool. This entry was posted in Conservation, Field Guide, Land Stewardship. Bookmark the permalink.